Sometimes, it is possible to make a detailed study of the benefits that member could receive by joining the free gardeners. 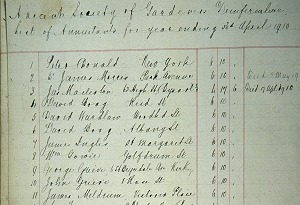 Peter Donald joined the Ancient Society of Gardeners in and about Dunfermline on 10 June 1864. He was then 38 years old - just one year below the upper limit for membership. Most societies placed limits on the allowed entry age, to minimise risk to their funds; older members were a bigger drain on resources. It cost Peter £4 16 shillings and 3 pence to join (now £4.81), but that was the only payment he made to the society. Dunfermline was unusual because it did not need to ask for regular contributions from its members. It could fund its commitments from the regular revenue it received as a landlord in Dunfermline. Despite his age at entry, Peter was able to benefit from his membership for many years. He was admitted as an annuitant (pensioner) of the Society on 31 October 1891. In 1910 his annuity was paid to him in New York, USA, where he was resident. He died there on 9 April 1915. Over the years his benefit totalled more than £150 - a good return on his investment. Other societies had different terms and conditions, for example at Letham in Fife. 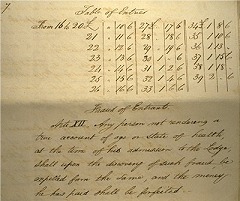 The rulebook of the Stratheden Lodge set out the entry terms and entry money. It continued with details of sickness payments. These were paid to members at the rate of 4/- (20p) weekly for up to thirteen weeks. The member had to show that he was unable to 'earn his daily bread' due to illness or accident and not because of self-injury. After that time the benefit dropped to 2/- (20p) weekly for a maximum of nine months. After that it was only 1/- per week. After the introduction of the National Insurance Act in 1911, lodge accounts and administration became more complicated. The Penicuik Free Gardeners' Friendly Society published their accounts annually. In 1946 the lodge administered three funds - the Sick and Funeral Fund, the Management Fund and the Lodge Fund. 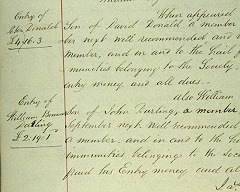 The expenditure section of the sick and funeral fund is a good example of lodge benevolence to members and their families. Payments amounting to £755 10s 10d (£755.54) had been made during the year.